The Yankee Peddler Festival, held over three weekends in September, celebrates Ohio history, food, crafts, and art. 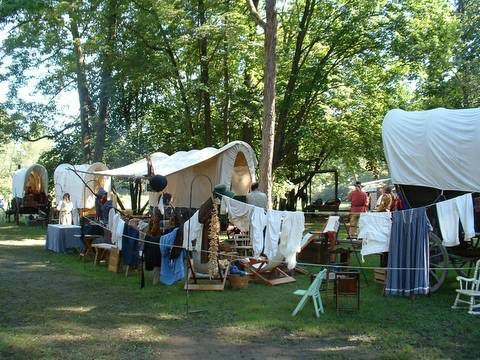 The festival, features dozens of quality artisans, authentic 19th-century cuisine, and costumed volunteers, all in a relaxed wooded setting. The dozens of artisans and crafters (more than 200 scheduled for this year) are set up throughout the wooded park, many offering demonstrations of how they create their work. Items for sale vary from wrought iron yard ornaments to quilts to glass art to woodworking, and more. Items range in price from a few dollars to several thousand dollars. There's something for almost everyone at this event. In addition to the art and craft displays, the Yankee Peddler Festival features live entertainment, including puppet shows, clog dancers, storytellers for children, bagpipers and a variety of other musicians. There are also food vendors, many of whom offer authentic 19th-century fare, and costumed volunteers who give the event a festive, prairie atmosphere. The Yankee Peddler Festival is open all days from 10:30 am to 6 pm. Admission is $10 for adults, $9 for those 60 and older, and $3 for those 2-11. Children under 2 are admitted free. The Yankee Peddler Festival is located about 1 1/4 hour's drive from Cleveland, off of I-77 and Route 21. Exact directions may be found on the Yankee Peddler website. The Hampton Inn in Massillon (check rates) is located at I-77 and Route 21, about 10 minutes from the festival. In addition, Canton area hotels are about 20 - 25 minutes from the park and Akron hotels are about 35 minutes away. Camping is also available at the Clay's Park Resort. No pets (other than service animals) are allowed in the festival. In addition, to help preserve the authentic nature of the event, no water bottles will be sold (although cups of water will be available.) If you want to carry a water bottle, organizers suggest that you bring one from home.